Fairy culture and celtic myth will figure prominently in HEX CODE and the second and third Dakota Frost trilogies, so I’m feeding my head now. And HEX CODE is a young adult novel, so I’m reading as many young adult novels as I can now. All three of the ones I just started – FIVE FLAVORS OF DUMB, FORGIVE MY FINS and INK EXCHANGE – are great, though so far I like INK EXCHANGE the best. I have two reading queues – print and audiobook – and I just finished FALLEN on audiobook, which was pretty good even though it took a while to get going, and have just started ACROSS THE UNIVERSE, which started off deliciously brutal but now I’m wishing the characters could cut a break. Next in the audiobook queue, eagerly awaited: GOLIATH, the third in Scott Westerfeld’s steampunk YA trilogy. 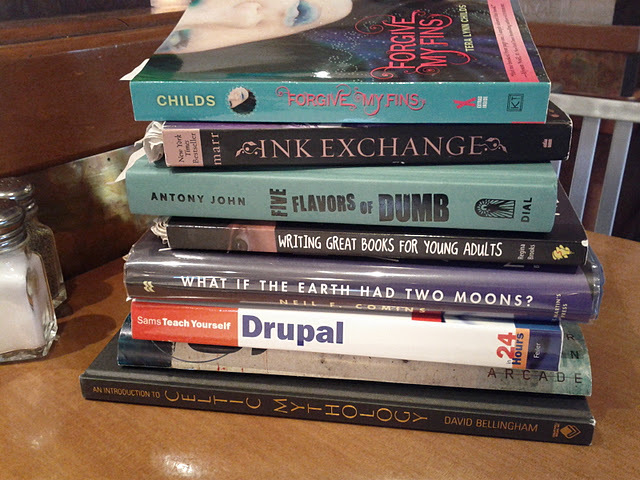 The upshot of all this is I think I can tell the story I want to tell with Cinnamon and remain true to the YA genre. The Dakota Frost books are aimed at an adult audience, and scaling that back intimidated me. It doesn’t anymore … but I still want to make the story fun and true – or should that just be true fun? P.S. The Drupal book is not a sign I’m about to redo this site (again) but I need it for my work on Blitz Comics. And WHAT IF THE EARTH HAD TWO MOONS is research for my science fiction YA novel, STRANDED. This entry was posted in Uncategorized and tagged Audiobooks, Cinnamon Frost, Dakota Frost, Writing Notes. Bookmark the permalink. Researching the next books has been fun. I wish I could write 24 hours a day! How is the Writing Great Books for Young Adults book? I liked it a lot and read it cover to over. The best advice though is “read lots of YA before you write it”. (Unless you have a YA busting out of you in which case go for it).